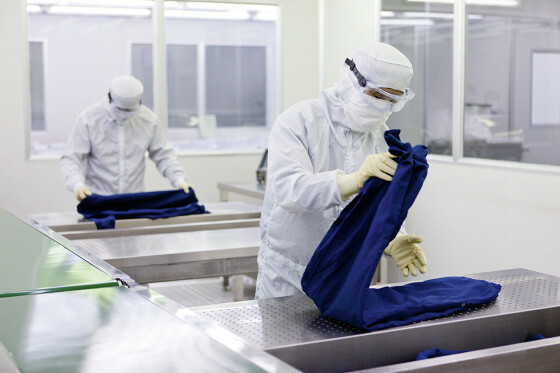 All Cleanroom clothing must satisfy strict quality requirements in order to guarantee product safety. Cleanroom clothing requires ultra clean processing within validated ISO cleanroom environments in order to meet EU regulatory requirements. Read on to find out more. Cleanrooms are required in more sectors than most people would assume including the pharmaceutical, medical device and biotech industries, as well as in medical research and of course the production of microprocessors. As the name suggests, Cleanrooms are controlled environments in which stringent cleanliness rules and hygiene regulations apply. After all, cleanrooms must provide a particularly clean environment to prevent products or processes from being contaminated. This means that both airborne particles and bioburden must be monitored continuously. Staff who work in cleanrooms present the greatest source of contamination to the products manufactured. It is people who bring contaminants into the cleanroom and, in turn, to products and processes via particles which are shed in the form of skin flakes, hair or bacteria. Cleanroom clothing performs a critical protective function, it acts as a barrier between the person, the cleanroom and the product. To be effective Cleanroom clothing has to satisfy specific requirements but most of all it must act as a barrier. The material used is designed using continuous filament polyester that retains particles while allowing the fabric to breathe. This enables cleanroom clothing to function as a filter by preventing harmful contaminants from entering the cleanroom environment. So how can contamination from street clothing be prevented from entering the cleanroom? The answer is Cleanroom Undergarments. These are special items of clothing which are worn instead of normal clothing under cleanroom suits. Cleanroom undergarments offer a number of advantages in terms of comfort and convenience. Tests have shown that contamination in the cleanroom is increased when employees wear normal street clothing. The use of cleanroom undergarments can reduce particle concentrations in the cleanroom by more than half. is an expert in the field of cleanroom textiles. We implement a comprehensive solution from A to Z for cleanroom clothing and textiles: We adapt the clothing together with the team and check it for any defects before decontamination. 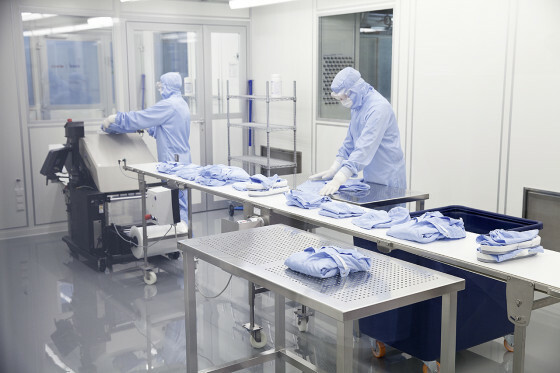 Our rental service includes the cleaning, decontamination and sterilisation of your cleanroom clothing on an agreed frequency while complying with all relevant ISO requirements and GMP.